Philip Glass may be counted among the greatest living composers today, but much of his work has already begun to be forgotten. Even though Music with Changing Parts was composed as recently as 1970 it has not been often recorded or performed. This piece is in fact one of Glass’s most influential, important, and impressive works. That said it is understandable why most listeners would not know of the piece. 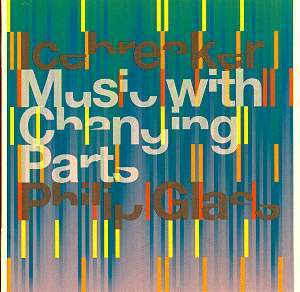 Music with Changing Parts was previously only released on LP, two discs, with a limited circulation on Glass’s own Chatham Square label. Additionally the work was out of print from the late 1970s until 1994. In the recorded format the work had to be inappropriately faded in and out at the beginning and end of each side due to the limitations of the medium. With music of this magnitude that damaged the listening experience to a point where the initial recording could not be considered representative of a live performance. In 1994 Glass remastered the recording and re-released it However after that was completed Glass appeared to consider the work to be largely in his past. While he toured with the work throughout the 1970s and 1980s he exercised a great amount of influence over musicians such as Brian Eno and David Bowie. This manifested itself as early as 1973’s No Pussyfooting by Brian Eno and Robert Fripp. Even so Glass considered the piece largely a developmental work on the way to Music in Twelve Parts and Einstein on the Beach. Thus it was largely ignored by the recording industry until very recently. Icebreaker have come to the table with a new recording of this long discarded but now rediscovered work. Describing the auditory experience is not straightforward. The 13 piece ensemble is very reminiscent of the original Philip Glass ensemble, with a collection of both electric and acoustic instruments. This recording makes use of several synthetic sounds, marimba, flute, saxophones, guitar, the electric violin and bass guitar in addition to Rowland Sutherland’s occasional vocalise. The work in many ways foreshadows Glass’s more recent film scores with long tones sitting atop the intense and persistent ostinatos that form its foundation. Instruments slowly enter and exit to create an entrancing sonic wall. The effect is hypnotic and relaxing, though not really soothing. It simultaneously engages and excites the mind while numbing it. The performance of this work is really quite profound. Music with Changing Parts is as close as Glass ever came to modern jazz. There are improvisatory elements in the work; there is room for musicians to respond to the acoustic effects of the room during the performance or recording. The improvisation is carefully controlled, giving the performers only a few options, but there is also room for expression that does not exist in many other Glass works. The recording is pristine and performance remarkably tight. Performing long minimalist works is an exceptionally draining experience for many performers, but Icebreaker respond to the challenge exceptionally well. As a listening experience this piece is performed masterfully.